Not all companies work with Google Analytics. That’s why we want to complete your experience by integrating another powerful solution like Webtrekk, which is used inmore than 32 countries. This tool collects information from each person who visits your page or app and offers them opportunities based on their behavior. Now, in addition to having an overview of each user’s behavior, you can optimize the customer experience down to their interactions with customer service. This way, it’ll be even easier to personalize communication with customers and complete all sales opportunities. 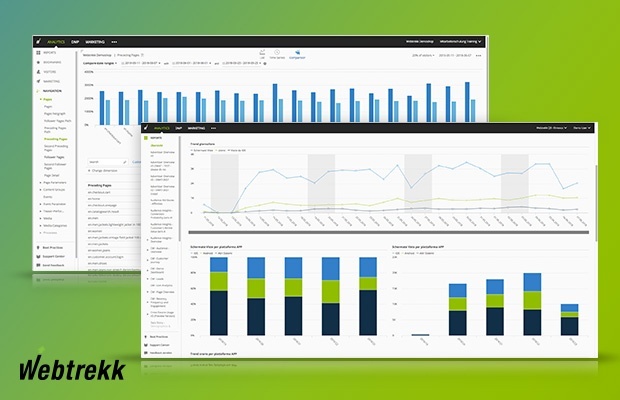 Webtrekk increases the profitability and investment of its customer’s marketing actions. Oct8ne succeeds in increasing a business’s sales. With this integration, Webtrekk feeds off ofvisitor interactions with the chat and will enrich user behavior analysis. Companies that use both platforms will be able to manage all of Webtrekk’s and Oct8ne’s information to better segment their visitors and offer help the minute they need to complete their purchase. All you have to do is access the Oct8ne control panel and go to Settings > integrations. Once there, choose what type of interaction you want to register in your analytics. Webtrekk will record the information about the proportion of users that click on Oct8ne. You’ll see the number of visitors that speak with your agents and you can gauge whattype of customer service you offer to each user. A contact form appears when agents aren’t available. Thanks to this metric, you’ll know how many times it’s used and whencustomers request more help but there are no agents available. When a user enters the chat they can choose the department they want to talk to, if this option has been activated. If you know which one they’re most interested in talking with, you can address it and reconsider your strategy on various levels. One of the most critical points in e-commerce. By integrating Oct8ne with Webtrekk, you can track the products that are added to the cart from the chat button and measure how effective a consultation with an agent is. You can see how many times images or videos of the products have been sent in the coviewer. User satisfaction is fundamental to knowing what works best and what we should improve. If you activate this follow-up method in Webtrekk, you can streamline your agents’ work. This measures user return. Capturing is increasingly more difficult and more expensive, so getting customers that return to your store is a great achievement. You can see how many do return so you can implementa personalized loyalty program.